Completed in 1884, restored in 1969 as Aeolian Town Hall, served as a centre for political and social life in London East until 1947. Erected 1972 by The London Public Library Board. Location. 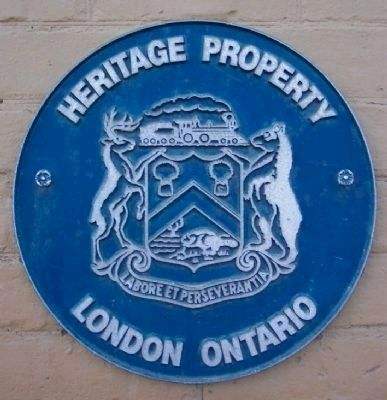 42° 59.441′ N, 81° 13.491′ W. Marker is in London, Ontario, in Middlesex County. Marker is at the intersection of Dundas Street East and Rectory Street, on the right when traveling east on Dundas Street East. Touch for map. 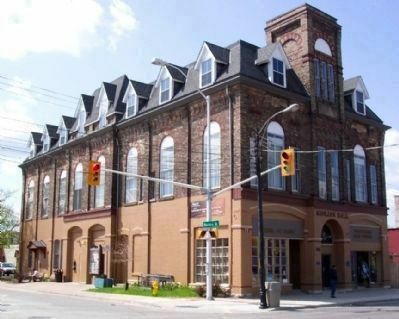 Marker is at or near this postal address: 795 Dundas Street East, London, Ontario N5W 2Z6, Canada. Touch for directions. Other nearby markers. At least 8 other markers are within 3 kilometers of this marker, measured as the crow flies. Engine 86 (approx. 0.4 kilometers away); Birthplace of Insulin (approx. 0.6 kilometers away); Birthplace of the Flame of Hope (approx. 0.6 kilometers away); Banting House (approx. 0.6 kilometers away); Harold A. Rogers, O.C., O.B.E. (approx. 1.6 kilometers away); London Armouries (approx. 1.6 kilometers away); London War Cenotaph (approx. 1.8 kilometers away); Veterans' Garden (approx. 1.9 kilometers away). Touch for a list and map of all markers in London. Marker is on the left front entrance pillar. More. Search the internet for The East London Town Hall. Credits. This page was last revised on June 16, 2016. This page originally submitted on May 14, 2009, by William Fischer, Jr. of Scranton, Pennsylvania. This page has been viewed 1,473 times since then and 3 times this year. Photos: 1, 2, 3. submitted on May 14, 2009, by William Fischer, Jr. of Scranton, Pennsylvania. • Syd Whittle was the editor who published this page.